BB-8 joins several new characters on Star Wars Resistance. A huge chunk of unknown Star Wars lore is about to be explored, and executive producer Justin Ridge can’t wait to be a part of it. Ridge is one of three executive producers on Star Wars Resistance and io9 had a chance to speak to him about this new Star Wars animated series coming to Disney Channel and Disney XD. The events that lead up to it start with Poe Dameron meeting a young, brash pilot named Kaz Xiono and recruiting him to help the Resistance with a secret mission on a faraway planet. It’s a planet filled with all kinds of people—good, bad, alien, droid, and more—but, because of its place in the overall story, there are no Jedi. Much of Resistance, at least at the start, takes place on the Colossus, which is a huge platform on the Outer Rim planet Castilon. There, ex-Rebels, Imperials, scavengers, scoundrels, and everyone in between hang out, drink, and gamble on high stakes races between all kinds of hotshot pilots. That setup, obviously, opens the door for dozens of new characters as well as interesting decisions in terms of the look of the Star Wars galaxy. New droid Bucket is a great example of this hybrid time period. Not everything is a mix between the eras, though. Ridge and his team thought it was important to have some very recognizable connections to the new Star Wars movies, and that’s why Poe Dameron and Captain Phasma will appear on the show. Beyond those two characters, just how connected Resistance will be to Star Wars at large is still a mystery. Given its title, it seems likely we’ll learn not just more about the Resistance before (and perhaps even during and after) The Force Awakens, but the First Order as well. That means, hypothetically, we could learn more about Kylo Ren, Supreme Leader Snoke, and many others. However, Ridge was very quick to explain that while anything is possible, they would only bring in movie characters if the situation called for it. Kaz and BB-8 hanging on the Colossus. Whether or not characters from the First Order, Aftermath novels, or anything else appear, we do know Kaz starts Resistance with a very specific mission. Logically, at some point, he’s likely to complete that mission. The question is will that be a multiple season story or just the start of something larger? Ridge wouldn’t say for sure but his cryptic answer seemed to suggest this was just the beginning. 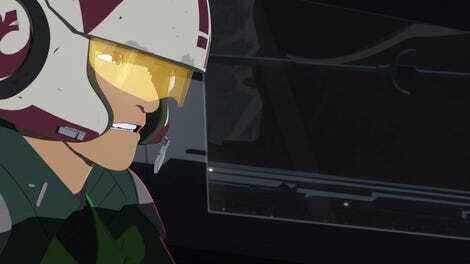 Looking to the sky on Star Wars Resistance. Just don’t expect those stories to get as dark as the movies. 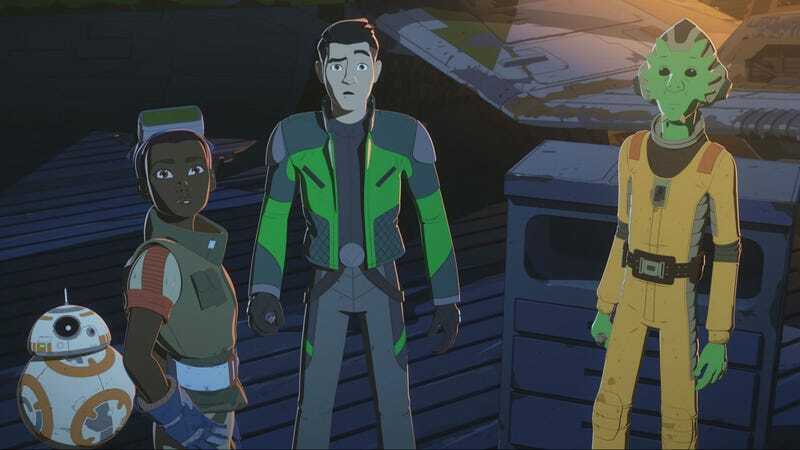 Star Wars Resistance is, by design, a show aimed at younger audiences. But Ridge stresses balancing that with Star Wars of the past is one of their biggest challenges. Star Wars Resistance premieres its first two episodes at 10 p.m. this Sunday on the Disney Channel and Disney NOW. All future episodes will follow the same pattern, premiering on Disney Channel Sunday nights with subsequent airings on Disney XD. Correction: An earlier version of this post said only the premiere would debut on Disney Channel. That has been updated.